In a world in which global warming is heating the ocean as well as melting ice caps and glaciers, the rising sea is driving salt-water onto the streets of the city. For the second time in four weeks, high tide predictions are being exceeded by 8-12 inches along Florida's southeast coast. That means that whenever you look at a tide prediction table (from the National Oceanic and Atmospheric Administration, for example) you have to add a foot to the forecast high water mark. Since this is the time of the year in which gravitational forces between the earth, the moon and the sun are strongest, the astronomical tide is already expected to reach its highest level of the year. 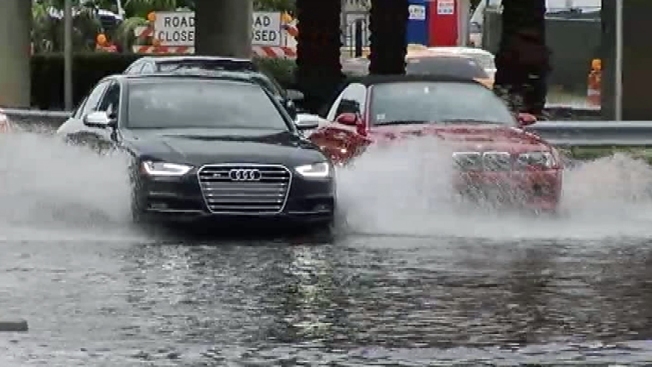 But while South Florida cities have dealt with nuisance King Tide floods each October, now they're becoming deeper, more widespread and chronic. Between one-third and one-half of the higher water levels comes from sea level rise. In Virginia Key, near downtown Miami, the tide gauge has detected a 4 inch rise in sea level in just the last 20 years according to University of Miami researcher Brian McNoldy. Keep in mind that the datum calculated for use in the NOAA tide tables dates back to the 1983-2001 epoch. If we use 1992 as the midpoint of that period, you can understand why 23 years later in 2015 the tide predictions are consistently coming up several inches short when forecasting the highest tides. The day the tide datum is recalculated, it will finally account for the accelerating rate of sea level rise. Perhaps NOAA needs to plan on recalculating these more often. There are other factors boosting the reach of the high tides. The Gulf Stream travels slowest this time of the year, plus all the fresh-water melting off Greenland in the North Atlantic has slowed it down further. Fresh water can't sink as quickly as saltier water, and the great conveyor-belt of ocean currents in the Atlantic is moving slower. Ocean heat content is higher (due to seasonal warming as well as climate change), and warmer water occupies more space. A few weeks ago the barometric pressure was running below normal, which also contributed an extra inch or two to the height of the sea. Not all of these exacerbating factors will coincide at the time of King Tide each year. But we can always count on one, sea level rise. Recently, the Southeast Regional Climate Compact, a partnership between four southeast Florida counties to address climate change, doubled their projections of sea level rise for the next 15 years to between 6-10 inches. I'll say that again: 10 inches more by 2030 is possible. By 2060 their projections show as much as 26 inches, and by 2100 they’re contemplating as much as 61 inches for South Florida. Imagine a Miami Beach or a Fort Lauderdale with their new adjusted NOAA tide table showing values 10 inches higher. The salt-water flooding wouldn't be limited only to October. It would be observed in many months of the year. Residents and tourists would need to wade to their apartments or hotels dozens of times a year like they do now during king tides a few days a year. Some street closures would become chronic or permanent. Insurers and reinsurers may be much less inclined to underwrite homes and buildings with a higher storm surge risk. You can almost play the movie in your head. And it's rated for mature audiences only.